THE TERMINAL AT Phnom Penh’s airport is pale and low-slung and clings to the edge of the concrete apron as though trying to escape the relentless heat that lies heavy on this wretched land. It is June 1977 in Democratic Kampuchea, the name Pol Pot’s revolutionary government has given Cambodia after seizing control two years earlier, and black-clad Khmer Rouge soldiers await the arrival of the weekly flight from Beijing. From the north a dark speck draws closer through the heat haze and takes familiar shape. This plane is Democratic Kampuchea’s only formal link with the outside world. Among those on board is 30-year-old Ouk Ket, a handsome junior diplomat who for the past five years has been based at the Cambodian embassy in the West African state of Senegal. Some months earlier Ket had received a typewritten letter, a soothing demand to return home. 1. The ministry has decided to ask you to come back to Cambodia. Please make arrangements for the trip upon receipt of this letter. 2. As for your family, please ask them to wait for a while. They can stay with their parents. 3. As for the embassy building, we have asked the Chinese embassy to look after it. Please also confirm with the Chinese embassy. 4. The government requests you to come to Cambodia to get educated to better fulfil your responsibilities. The letter was signed by Democratic Kampuchea’s ambassador to China, Pich Cheang, a short, animated man in his 30s. Pich Cheang, who favoured peasant garb, gold teeth gleaming beneath a crew cut, was a fervent believer in Cambodia’s revolution. It was, he held, perfect in every way and had nothing to learn from others, not even from Democratic Kampuchea’s friends. An Australian diplomatic memo written around that time described Pich Cheang as a smiling, burgeoning presence on the diplomatic circuit despite his apparent lack of Chinese, French or English, the lingua francas of the Beijing ambassadorial corps. China and Cambodia were, as the saying goes, “as close as lips and teeth” but this was largely a one-way relationship. China was the regime’s key backer supplying arms and food, diesel fuel and farming implements, as well as thousands of advisers to help the revolution succeed. The letter sent to Ket was one of hundreds that went to Cambodian diplomats and intellectuals around the world calling them home to rebuild a nation that had suffered greatly during five years of civil war. Although the letters seemed benign, in truth they were a ruse. The leaders of Democratic Kampuchea had become increasingly convinced that their enemies were everywhere, even and especially hidden within the ultra-Maoist movement’s own ranks. Tens of thousands had been murdered in purges that obliterated the ranks of the previous government. Now these purges were sweeping through the new ruling class. For Democratic Kampuchea’s leaders, men like Ket are quite simply not to be trusted. Ket is a royalist, not a communist; moreover he is educated, which counts further against him. Worse still he is foreign-educated. But Ket has little inkling of these dangers as the jet descends after its five-hour flight. Other than refugee tales there has been no news out of Cambodia since her rulers closed the borders in April 1975. There is no mail service and, other than the weekly plane from Beijing, nobody is allowed in or out. Away from the eyes of the world, the movement has restructured society to its bleak and brutal vision. No doubt Ket peers out of the plane’s oval window as the rice fields and sugar-palm trees of his beloved homeland rise up in greeting. Below him like mirrors are the vast, water-filled craters pitted in the soft skin of the land, a glimmering record of the years-long destruction wrought by thousands of B-52 sorties by the United States’ air force until 1973. Carving north to south through this tarnished scene are the pale, tea-coloured, silt-heavy waters of the Mekong River that flow past Phnom Penh before turning for Vietnam and the coast. Ket has been gone nearly a decade, first studying in Paris and then working at the Cambodian embassy in Senegal. Now he is almost home, and with that, you would think, will come the chance to see his parents, siblings and extended family — the cousins, aunts and uncles who are such an integral part of Cambodian life — to enjoy once again Phnom Penh now unfolding ahead of him, to eat the mild coconut fish curry called trei amok, to drink sugarcane juice, to pray at the Buddhist wat near his parents’ house. Who could not be filled with excitement at such a homecoming? Ket surely experienced the same feelings as another friend from his Paris days, a young Cambodian intellectual who had returned to Phnom Penh in July 1976. Like Ket, this friend was excited to be coming home to rebuild the country, and was similarly disbelieving of refugee stories of massacres and slave labour. The leaders were patriots, hard-working people, this young man thought. Cambodians would not kill Cambodians. He dismissed, too, the tales of starvation because, having grown up in a village, he knew this was a nation of abundance: fish, fruits and vegetables had always been plentiful. For this softly spoken, pro-revolutionary man, disillusion came quickly. Ong Thong Hoeung expected to see his family and friends at the airport, but on landing there were only child soldiers, angry-faced and dressed head to toe in black. He was seized by “a strange and terrible sensation” as though he had landed on another planet. But there were no welcoming smiles and no words of kindness, only a sullen mood that hung thick in the air. Hoeung grew fearful, even more so when the cadre at the immigration desk took his passport and threw it in a bin that was already half-full with others. “People told me I could get it back later, but in my heart I knew this was over,” Hoeung told me years later. It was a day of rude awakenings in the realities of the new Cambodia. From the airport, Hoeung and the others were taken in a clapped-out minibus through an empty, shattered city and offloaded at a training college that was now a re-education centre called K-15. There they were to “rebuild” themselves by breaking rocks, growing rice and, most importantly, by producing “fertilizer number one” — mixing human faeces with urine, a central task of the revolution’s drive for self-sufficiency. There were self-criticism sessions too whose overt purpose was to ensure they forgot everything that had gone before, stripping these “imperialist lackeys” of their individuality and subsuming them utterly to Angkar. On arrival at K-15, Hoeung met friends who had left Paris three months before. He barely recognized them. In short order Hoeung’s dream that he had come home to a socialist utopia was shattered. Eventually Angkar sent him to a labour camp where the optimism he had once held was crushed by a revolution that demolished humanity with lies, distortions and inversions of reason. The main enemies of the revolution, the returnees were told, lay within each one of them and it was their sacred duty to uncover that hidden foe. CAMBODIA HAD CHANGED beyond recognition between 1968, the year Ket had left for Paris with a scholarship to study statistical engineering, and that hot June day nine years later when his plane landed in Phnom Penh. In 1968 the head of state was Prince Norodom Sihanouk who had abdicated as monarch 13 years earlier to pursue politics. Sihanouk was sly, ruthless, charming and divisive, a combination that ultimately isolated people on the left and polarized the country. Yet even in 1968 the Khmer Rouge, at that time Sihanouk’s sworn enemy, were an annoyance more than a consequential danger, and Cambodia had not plunged into the abyss of civil war. Yet it was starting to teeter and many people were worried. Among those was Ket’s father, Ouk Chhor. In his privileged capacity as major-domo at the Royal Palace in Phnom Penh, Chhor ran the royal residence for Sihanouk. In that position he accompanied the Francophile prince on trips around the country and abroad. Chhor’s role was to attend discreetly to Sihanouk’s needs. He tasted the prince’s food, waited on him at banquets and helped him to dress. A photograph of a state banquet from that time shows Chhor, white-clad and hovering like a moth near the flame that was Sihanouk, ready to fetch, carry and tidy away. In the 1950s and 1960s a steady stream of minor dignitaries and a few significant ones visited Phnom Penh, then a quiet, low-rise city of 500,000 people. In 1966 France’s President Charles de Gaulle came; the following year it was the turn of Jackie Kennedy, the glamorous widow of US President John F. Kennedy. Sihanouk, charmed by Jackie, wrote jazz compositions in her honour. As the first-born, Ket was always going to be his father’s favourite, but he was also intelligent and hard-working, characteristics that pleased Chhor tremendously. The couple had another eight children after Ket was born in 1946, but he remained the golden child. The family was not rich but they were comfortable, and Chhor had enough land on his small plot in Phnom Penh’s undeveloped southern sector to give a portion to his wife’s brother in 1966. Ket’s uncle had moved back to the capital after struggling to make a living in Prey Veng, a south-eastern province along the Vietnam border. The brood of cousins became the family next door. Among them was 13-year-old Sady. These days Sady is a teacher, a diminutive lady with sparkling eyes and a gap-toothed smile under a fringe of cropped hair, and she lives with her husband and their children in a wooden house just yards from where the two families grew up all those years ago. The sound of monks chanting prayers at the nearby wat drifted down the dusty alleyway, mixing with rooster calls, the chatter and shrieks of children playing, and the puttering of motorbikes along the narrow pathway that runs outside her gate. It is typical Cambodia — religion, wooden homes, children, dust — and in Sady’s house an alert dog, a television that was always on, and an occupied hammock swinging as regularly as a metronome in the morning air. Sady has fond memories of Ket, who was seven years her senior. Ket was bright yet he would nervously chew his nails while revising for his exams. As we talked, a long-forgotten memory sprang into Sady’s mind: how Ket would use his foot to sketch the solutions to maths puzzles in the beaten-earth of the family compound before committing the answers to paper. “He always drew with his foot,” Sady mused decades later. Ket’s studiousness won him a scholarship from France’s foreign ministry to study in Paris, and though it would hardly have hurt his chances that his father worked for Sihanouk, he certainly had talent: Japan had offered him a scholarship too. His fluency in French likely decided the contest. Sady’s abiding memory of the young Ket was a young man who was obsessed with self-improvement. He exhorted his siblings and cousins to do better at school, bought books for Sady to improve her grades, and helped her brothers with their studies. In the evenings he strummed his guitar, and on weekends he and Sady ventured to nearby fields, now the dusty outer suburbs of Phnom Penh along Route 1, where he taught her how to catch changrit — a cricket-like local delicacy when fried. Sady poured water into the holes, and the changrit scrambled out in a frenzy into Ket’s determined grasp. In short, life in 1960s Phnom Penh was good. The children went to school, their fathers had jobs — Sady’s worked as a guard at the grim, French-built prison known as T3 — and they lived comfortably. Behind the two simple, stilted wooden homes was a large pond where the children went regularly to beat the year-round sticky heat by swimming or by boating across it in a two-metre-long wooden canoe propelled with a pole. Today many Cambodians remember the 1950s and 1960s as a golden age. Sady does too. Good though those years were, however, the country’s increasingly fraught politics meant the burgeoning tensions were obvious even to a teenager. TWO EVENTS STOOD OUT from those days. One was the time Ket took the children to nearby Nary Island. They played catch in the river, the big fish trying to trap these smaller human fish who tumbled in the shallows, a skinny-limbed jumble, squealing and splashing their way to freedom. When it came time to leave, Ket realized that a ring his father had given him had slipped from his finger. This was no ordinary ring: the gold band crowned with a diamond had been a gift from the king of Thailand to Chhor on one of his trips accompanying Sihanouk. Chhor had passed it on to his favourite child. Chhor bought the other children jewellery too, but for them it would be of gold or silver. The loss worried Ket so much that he stayed away for hours. In an effort to recover the ring Chhor hired several Muslim Cham villagers to dive the river’s muddy reaches. But the ring had disappeared, swept away and settled in the silt out of the grasp of human hands. A far darker cloud loomed in late 1968 during Pchum Ben, the 15-day Buddhist festival when Cambodians remember their deceased relatives, and take offerings and food for the ancestral spirits to the wats that have for centuries formed the hub of village life. Sady had just returned from a visit to extended family outside Phnom Penh and was sleeping under the house with her youngest brother and one of her younger sisters. Ket was next door reading a book. Around two o’clock on that warm afternoon she woke to a commotion. People were running and shouting, their voices brittle with panic. Sady and Ket rushed to the large pond near the house and saw villagers frantically searching for Sady’s younger brother Saroeun. Earlier Ket had spoken to his father and advised against the children using the boat on this baking day. But little Saroeun had gone with his two teenage cousins — Ket’s younger brothers, who were 17 and 18 — as well as two of his sisters aged 10 and 12. Halfway across the lake one of the girls jokingly threw out the bailing bucket. But the wooden boat had a leak and they needed the bucket to stop it filling with water. One brother stood up to try and retrieve it, the boat capsized, and the five were pitched overboard. Unable to swim well, Ket stood powerlessly on the shore watching his four flailing relatives, scanning the disturbed waters. Before long the four were back on shore with the boat and the punting pole, but Saroeun was nowhere to be seen. “Ket grabbed the pole to beat his brothers, but my father restrained him saying: ‘Please don’t do that. Your brothers had not meant for Saroeun to die,’” Sady said. Saroeun’s body surfaced the following day. He was just seven, and his death hit Ket hard. Two weeks later Ket left for France to take up his scholarship studying statistical engineering. That day he had a long conversation with his father, and then both families crammed in to a van that Chhor had hired for the 15-kilometre drive across town to the airport on the city’s western edge so that they could see Ket onto the Air France flight. As was Ket’s custom he continued to send books to Sady. He wrote regularly too, to her and to the rest of the family but, as it turned out, that November day in 1968 was the last time Sady saw her beloved cousin. PARIS AT THE END of the 1960s would have been magical for a young man fresh from the languor, heat and dust of Cambodia’s capital. The low-rise architecture of his hometown had little in common with the imposing stone edifices of Paris, but Phnom Penh’s government buildings of stucco and plaster, pillars, iron railings and high ceilings did echo those of France’s provincial towns. Ket spoke fluent French, which was still Cambodia’s official language despite the country having won her independence 15 years earlier, and was familiar with the literature and music of the West. By 1968 the rock and roll sounds of the US and Europe had infiltrated Cambodia, as had fashion, hairstyles and magazines — at least in urban areas — so although France was a foreign nation, it was far from alien. The year Ket arrived in Paris had been a time of significant change, a ferment of activism. The strikes and student riots that had convulsed France in May shaking the establishment were over, yet the political ideologies that motivated them were uppermost in the minds of many students. But not, it seems, in Ket’s. The 22-year-old was serious about his studies, and as the first-born son he had responsibilities that he was determined to fulfil. He wrote regularly to his family in Phnom Penh, and worked hard. It paid off: a year on he was admitted to the second and final year of his diploma with a score above 80 percent. There were many Cambodians in Paris, a legacy of France’s 90-year rule until its granting of independence in 1953. For decades France had awarded scholarships to bright Cambodians, and it was in Paris that several of these men and women were introduced to the seductive visions of Marx, Lenin, Mao and Stalin. Two decades before Ket arrived, some of those who would become the leaders of the Khmer Rouge, including Pol Pot, had studied in France; as the 1960s wore on and Cambodia’s politics drove adherents towards one extreme or another, a new generation of students in Paris would fracture along the polarized lines of home. Some who had returned to Phnom Penh in earlier years to engage in politics fell foul of Sihanouk as he kept a rigid hand on the reins of power. Some opponents were executed, others were jailed and tortured. As repression increased in the 1960s many fled to the maquis and joined the communist movement. Sihanouk christened them les Khmers rouges or Red Cambodians. By 1968, the leftist Cambodian students in Paris regarded Sihanouk as the enemy; given his father’s post, that must have put Ket in a tricky position. Explaining the wave of tumult that enveloped Cambodia from the late 1960s will come later, but suffice it to say that after 1966 Sihanouk lost the confidence of his increasingly independently minded government. In March 1970, his former colleagues — including his prime minister, Lon Nol — ousted Sihanouk in a bloodless coup while he was out of the country. Sihanouk, furious, travelled to Beijing where he was persuaded to join with his former enemies: the Khmer Rouge and their backer, North Vietnam. As political turnarounds go, it was one of the most remarkable of the twentieth century. For Sihanouk, who wanted to return to power, the temptations of such an alliance were irresistible. For Cambodia it proved to be of profound significance as Sihanouk exhorted his “children”, as he called the population, in tape-recorded messages to join with him and the Khmer Rouge in fighting the usurping pro-American regime. Thousands heeded the prince’s words, and the Khmer Rouge exploded from just a few thousand fighters to tens of thousands. Backed by China and North Vietnam, the Khmer Rouge forces would eventually become unstoppable. After allying himself with the Khmer Rouge, Sihanouk established a government-in-exile in Beijing: the Royal Government of National Union of Kampuchea, known by its French acronym GRUNK. Sihanouk became head of state, and established the Front Unit National de Kampuchea, or FUNK, as the political party for non-communists who wished to support what he now regarded as his revolution. The Khmer Rouge were to operate as GRUNK’s army on the ground. In the alphabet soup of the time, GRUNK was a composite of the Khmer Rouge and FUNK but as Sihanouk ought to have known, he who controls the guns has his hands on the levers of power, and that person was Pol Pot. As Brother Number Two Nuon Chea told the head of a visiting Danish Maoist delegation in 1978, allowing Sihanouk to become the nominal head of the resistance “meant nothing because we were the masters of the situation”. 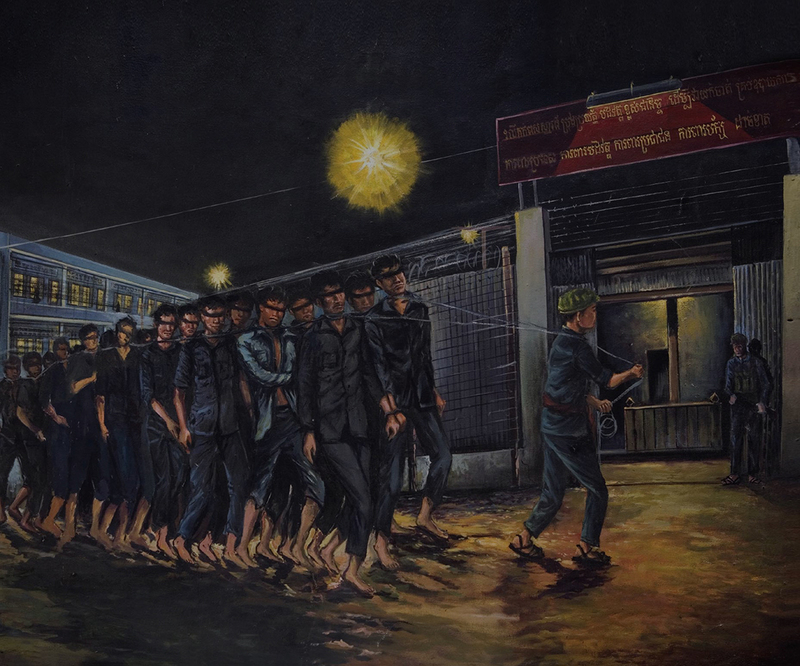 These, broadly painted, were the changes that had overtaken Cambodia in the few years since Ket had left the country in November 1968. On that day Ket and his father had a long talk during which Chhor reminded his eldest how much the family owed Sihanouk, and told him: “You must never betray the Prince.” That instruction would later have profound consequences. During his first year of study in Paris, Ket had managed to stay out of politics but the coup and Sihanouk’s dramatic realignment with his former enemies meant neutrality was no longer possible. Ket made his loyalties known, driven no doubt in part by his father’s words. When Ket’s second and final year of study came to an end, supporting Sihanouk meant he could not return to Phnom Penh. The capital, like most of the country in 1970, was under the control of a new, anti-Sihanouk government. For Ket, going home was not an option. THE YEAR 1970 WAS MOMENTOUS for Ket on a number of grounds. It was his last year of study, which would be significant for any promising student, and his country’s tortured politics meant that he had been compelled to choose sides when he would rather have avoided doing so. It was also the year he met 18-year-old Martine Lefeuvre. It happened at a campsite favoured by students on the French coast where Martine, an only child, was holidaying with her parents and a friend. At the camp, the guitar-playing Ket won a music competition playing Beatles’ songs — Ticket to Ride and Hey Jude. Martine took one look at him and thought: this is the man for me. They fell in love and a few months later Martine moved in with Ket at the Pavillon du Cambodge, the halls of residence for Cambodian students at the Cité Universitaire on the southern edge of Paris. Politics made residence life tense and at times dangerous, with older Cambodian students espousing the Soviet-influenced Communism of the French Communist Party battling their younger colleagues who preferred Mao’s version. In one incident the couple were caught between two groups of fighting students; Ket grabbed his books and his girlfriend and they fled their room. They married the following year at the Hotel de Ville in Martine’s home city of Le Mans. Ket was 25, fresh-faced and beaming, and wore a white carnation in the buttonhole of his navy blue suit. Martine, in a simple white dress, her brown hair swept back and a bouquet in hand, looked exultant. In one image Ket stands behind Martine’s seated grandparents, his thin, dark tie with white polka dots matching the one worn by Martine’s beret-clad grandfather. Even the weather played its part, with the wedding party on the terrace bathed in autumnal sunshine. Two months later, Ket’s loyalty to Sihanouk was repaid when he was posted to Senegal as third secretary at GRUNK’s embassy in Dakar. Senegal was one of many countries that refused to recognize Lon Nol’s government that had overthrown Sihanouk, insisting instead on the legitimacy of his exiled GRUNK movement with its Khmer Rouge ally. Martine joined him there in January and the following year their son Mackara (meaning “January” in Khmer) was born. They were still in Senegal when their daughter Neary, which means “Lady”, was born in July 1975, three months after the Khmer Rouge had taken power. Those years in Senegal, said Martine, were the happiest of her life. “We were a Franco-Khmer couple whose children were born of African soil, and this tri-continental contribution was the wealth of our family: a family that was open to the world without any kind of prejudice regarding race or religion or regarding lifestyle,” she said. Her parents in France loved Ket as a son, and Martine learned to read, write and speak Khmer, the language of Cambodia with its simple structure, its vast vocabulary and its intricate Indian-derived alphabet. Ket had impressed her with his guitar playing, yet he also played the mandolin, the harmonica and the Cambodian flute despite having no formal training. He was a dab hand at volleyball and at preparing food too, whether Cambodian or French, Lebanese or Indian. He wrote home often and travelled in the region too. There is a picture of him sitting barefoot on a reed mat in a Tuareg tent, smiling, holding on to a wriggling baby goat while the tent’s owner and family face the camera with him. He looks relaxed, a man every bit at ease in the tent of a Tuareg nomad as at the formality of a diplomatic reception. It was not to last. In 1976 Sihanouk, who had returned to Phnom Penh after the Khmer Rouge’s victory the previous year and been installed as head of state, realized he had been duped and wielded no power. The Khmer Rouge leaders soon forced him to resign. Sihanouk was not allowed to leave but, probably at China’s insistence, the Khmer Rouge let him live despite murdering several of his children and grandchildren. For the next three years Sihanouk was a prisoner in the capital. The effects rippled across the globe to Senegal. Although Pol Pot’s Democratic Kampuchea had maintained the GRUNK positions at overseas embassies, Cambodia was a closed country that earned almost no money from trade. Ket had not been paid in more than a year and the couple had little left in the way of savings. The pressure was already building when, in April 1977, the letter arrived recalling him. The following month the couple returned to France and decided that for the time being Martine and the children would stay with her parents. Initially Ket contemplated taking Mackara, who was nearly five, but at the last minute he changed his mind. Going home to help rebuild his homeland, which had been ravaged by more than a decade of war, was a heady prospect for Ket. Ket turned to Martine, tapping her gently on the cheek. “But, honey, Cambodians are not savages,” he told her with a smile. “And he was so sure of himself, so when I heard that I trusted him,” she recalled. The lack of news from his family over the past two years concerned Ket, but the trip represented a chance both to reunite with them and to prepare for a new life in a land Martine had never seen but to which she was happy to move. Ket packed passport photographs of Martine and the children, and promised to send a Cambodian passport in due course. There would be plenty for Ket to do before then. For a start he would need to find a home for his family in Phnom Penh, unless of course the foreign ministry chose to send him abroad again. His only doubts were what sort of work the regime would allocate to him. The final sentence in the letter seems to have unsettled him: “Come to Cambodia to get educated to better fulfil your responsibilities.” What could that mean? “So he went back in that state of mind, in full confidence,” she said. THERE IS A PHOTOGRAPH taken on the day Ket left France. It is June 1977, a fine summer’s day, and he is standing in his in-laws’ garden in Le Mans with Martine. She holds Mackara, Ket holds Neary, who looks at the camera with a two-year-old’s puzzled expression. Behind them is a trellis fence with a creeper, and in the flowerbed are white arum lilies. The scene is pure 1970s suburbia: Martine, 24, in a red jersey and beige trousers; Ket, 30, dressed as for a business trip: hair neatly combed, a blue shirt and tie under a buttoned-up navy cardigan, pressed dark trousers and polished black shoes. Ket looks at the camera through his new sunglasses with the hint of a smile, or perhaps his mouth was caught in a moment of banter with his father-in-law. The image is ordinary, but the moment it represents is profound: of a man setting off for his homeland after nearly a decade away. AT THE AIRPORT IN PARIS, Martine and the two children said their farewells. Ket walked through passport control with his diplomatic passport and on to the plane that took off for Pakistan and then China, the weekly flight from Beijing being the only way to reach Phnom Penh. The next postcard was from Beijing. There was little for the children to enjoy in this austere image. In Maoist style it was a dull photograph of the orange-bricked Overseas Chinese Hotel where Ket was instructed to stay. Even the two stamps convey revolutionary fervour — a red, caterpillar-track tractor is hoisted across the face of one stamp to join a uniform line of red tractors. The other, placed upside down, portrays a heroic-looking worker with a hoe over his shoulder being applauded by another. The postcard was signed by a fellow Cambodian, Loeung Hong Sour, a friend of the couple. Sour had worked at the GRUNK embassy in Tanzania as third secretary and had received a similar letter recalling him to Cambodia. In the postcard Ket told Martine and the children: “On June 11, 1977 I will be in Phnom Penh.” In Khmer he repeated his love for them, again telling the children that they “must study hard”. On June 11, a Saturday, the weekly flight from Beijing took off with Ket and Sour on board. Several hours later it touched down in Cambodia’s swelter and the two men disembarked. In Le Mans the days slipped long and dry through high summer, and Martine held on to the two postcards and waited for further news. The couple had agreed that once Ket was settled in Phnom Penh and knew what the foreign ministry had planned, he would mail another postcard calling the family to Cambodia. And so Martine, Mackara and Neary waited. As the weeks passed, the summer heat cooled to autumn. Still there was no word from Ket. In September, Martine took the children to the Chinese Embassy, which was housed in a grand building on Paris’s Avenue George V. As Beijing was Ket’s last known stop and as China was Democratic Kampuchea’s staunchest ally, it was logical to see whether the embassy could assist. But the Chinese Embassy refused to help. Martine returned home empty-handed and the family continued living in this strange, suspended state. Autumn became winter, and in Le Mans the pale petals of the arum lilies were crushed by the cold and became one with the freezing soil. Christmas was a mute affair. As 1978 began, there was still no news.